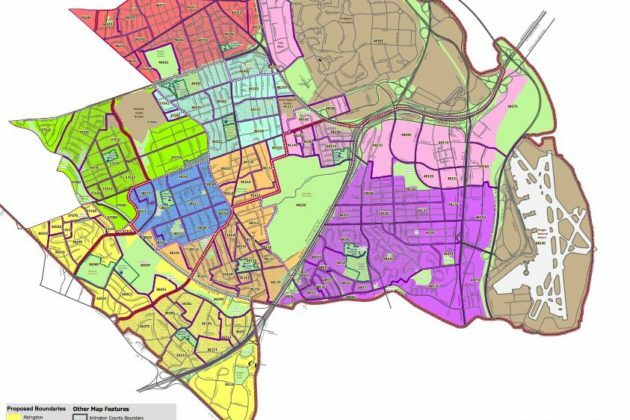 Arlington school officials recently realized they made a critical error in calculating school enrollment rates as they prepared a final proposal for the redrawing of attendance boundaries in South Arlington, prompting the last-minute introduction of a new map to correct that snafu. The School Board is gearing up for a final vote this week on boundary changes at eight elementary schools, which will conclude a lengthy, contentious process stretching over the better part of the last six months. Superintendent Patrick Murphy put forward what was meant to be a final proposal last month, but officials then tinkered with that map to better distribute students across the schools involved and reduce overcrowding. The school system released the result of some of that work last week, with figures initially showing that the new Alice West Fleet Elementary School would open next fall at close to 100 percent of its planned capacity. The school’s opening helped prompt the boundary adjustment process in the first place, and the school system’s methods for determining which communities will head to Fleet have become particularly controversial in recent weeks. However, staffers soon discovered they’d erred in counting the number of students set to head to the school. The proposal actually would’ve opened Fleet at about 82 percent of its capacity, far below the standard officials hoped to hit. Accordingly, the Board convened a new work session for last night (Tuesday) to examine a revised map accounting for that mistake. That new proposal would leave Fleet closer to 90 percent capacity instead, largely by redirecting some students currently attending Long Branch Elementary School to Fleet. 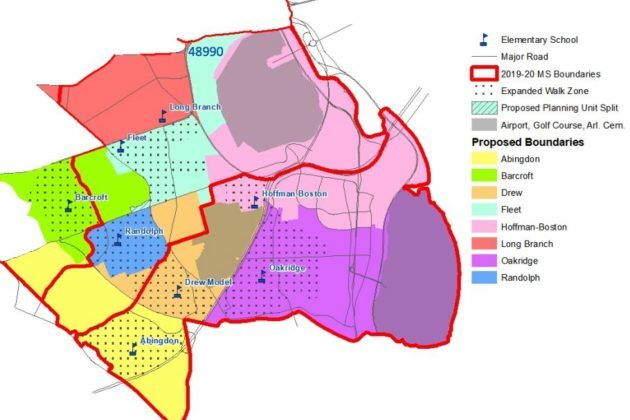 The Board will ultimately have a chance to vote to approve this newest map, or any of the other six proposals the school system has worked up thus far. Lisa Stengle, the APS director of planning and evaluation, told the Board that the change won’t pull all that many students away from Long Branch, a process officials hoped to avoid given the last-minute nature of the change. Instead, the school system discovered that a variety of students attending the Ft. Myer Cody Child Development Center at Joint Base Myer (some of whom are the children of active duty service members) currently attend Long Branch or even Patrick Henry Elementary after receiving a special waiver to do so. Those students would be sent to Fleet instead for the next two years, Stengle said. “We just need to give Long Branch a little breathing room,” Stengle said. The school will open at about 101 percent of its capacity under the latest plan, down from its current 113 percent. School officials were optimistic that the change will work out for the best, filling more of Fleet but still allowing for a little bit of wiggle room at the school moving forward. But, given the acrimony that the boundary process has generated everywhere from the Drew Model School to Abingdon Elementary to Henry, Murphy was also quick to acknowledge that this latest error came at an unfortunate time. Goldstein was similarly conciliatory, particularly after parents at Henry accused him and other school officials of delivering assurances that their community would move as one to Fleet this year. Drew’s Montessori program is set to move to Henry, forcing current students out of the building, and the school system’s latest plans call for about 20 percent of those students to go to schools other than Fleet. Parents even dug up emails from years ago featuring Goldstein providing such promises, and he expressed plenty of regret for having done so. Board members also addressed a proposal from some Henry parents to convert Drew into a hybrid neighborhood-option school drawing in students from across the county to its STEAM program. Its backers hoped such a change would help keep the Henry community together and build a strong base of support for Drew, but many in Nauck resisted such an effort. Board member Monique O’Grady pointed out that part of the intent of moving the Montessori program out of Drew was to “give Drew its neighborhood school back,” and she felt the STEAM proposal ran counter to that purpose. Goldstein praised the proposal, noting that “some parts of it are very intriguing and some parts are attractive.” But he also agreed with his colleagues that it would be too difficult to manage such a change on such short notice, particularly without consulting with the Drew community first. Even still, Goldstein and his fellow Board members praised the community for being engaged enough on the issue to come up with such a proposal in the first place. And, with the Board set to approve a final map tomorrow (Thursday), O’Grady urged concerned parents to channel that energy into a positive outlet going forward.